Lorraine Chittock, DOG and Bruiser in New Orleans. 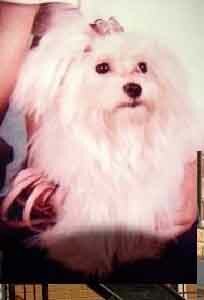 The owner of Princess is still desperately searching for her lost white Maltese. Her other two dogs have been found but are needing to be reunited! Bryce, a volunteer at the Winn Dixie staging area in New Orleans, spends some time with one of the 'aggressive' dogs. Volunteers from the animal group 'Bitten by a Kitten' bottle feed abandoned kittens. This emaciated pup was being taken by the SPCA to a new home. These dogs were captured and are now on their way to foster homes. 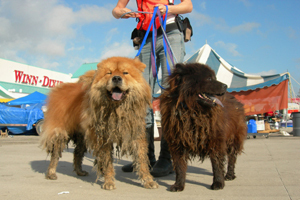 After being washed three times, these two chows fur is still caked with toxic mud. Rescue efforts continue in New Orleans and all along the Gulf Coast. 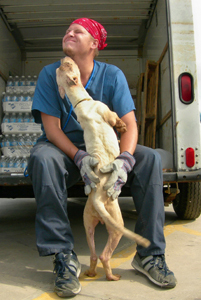 Long weeks after Hurricane Katrina came through, animals are STILL being pulled out of houses alive. How is this possible? Obviously more resilient than humans, I wonder if instead of expending unnecessary effort on emotions, their systems close down and all available energy is used on survival. Thank you for those who bought ON A MISSION FROM DOG T-shirts in September, or the latest edition of CAIRO CATS-EGYPT'S ENDURING LEGACY for which 15% went to Best Friends Hurricane Rescue Efforts. Click here to give directly to Best Friends Hurricane Relief Efforts . In the past week, one of the gerbils began exhibiting seizure type symptoms, spinning around in circles, as if it were rolling down a hill�but the hill was the aquarium and its movements were in place. I did a quick web-search and determined it was having seizures, which occurs in 20-40% of the little critters. The mother, who felt as detached as I, bemoaned, "The kids want me to take her to the vet. The vet's going to cost more than the gerbil!" One afternoon after doing errands I arrived home just as Neil the boy was leaving for soccer practice. "We took Choey to the vet! She's not going to die, I hope. The vet thinks Choey's got an ear infection and she's twirling because she can't tell what's up or down. I'm feeling kind of pleased with myself... I was the one who made the call." Which indeed he had. The mother said, "Yeah, he did. I've got a mountain of work, so when he said again that he wanted to take Choey to the vet, I said, 'Fine, you make the call.' And he did." In private Neil had divulged that if he had to live on a desert island, and had to choose between an animal or human companion, he'd choose animal. And that if he travelled around the world, he'd like it best if he traveled with an animal because there'd be less disagreements. He's twelve years old. He wasn't brought up with animals. Surely it was not just my dogs presence and myself that led him to think this way? I was raised around animals so it was amusing to see that the father, who had gone with Neil to the vet, was befuddled with the vets instructions of feeding and administering medicine to the little critter. And there was a slight glitch. They planned to be gone beginning Friday night for a weekend camping trip. "Do you think," they asked, "would you mind..." Of course I wouldn't mind. By my not having a nine to five job, it meant the three feedings a day could be increased to five or six in smaller increments and I could also make sure she got enough water which I would also administer through a syringe. And suddenly, with every time I picked the gerbil up, the 'it' turned into a 'she'. She also bit me every time. "She'll do that," Neil explained, "until she learns your touch." Neil was reticent to feed her and watched in horror when I held her tight against my chest so she wouldn't squirm. "You know Neil, it's a lot easier to take care of an animal you're not emotionally attached to. If this were Dog or Bruiser, it wouldn't be so easy. I'd be scared I'd be hurting them." That night, the family gone, I decided to put the metal watering contraption back in Choey's temporary home, just in case she got thirsty during the night. At 3am I awoke and couldn't go back to sleep. I wandered out to the kitchen to get something to eat and decided to do a feeding. After mixing the food and putting it in a syringe, I reached into the box for Choey. She was drenched. And cold. And very still. Somehow the water container had emptied onto the towel. "Oh no, how many hours have you been sitting there like that?" I quickly put the small wet body under my shirt and held her to my chest. After a few minutes I gave her some food. This time, she didn't bite. Slowly, she warmed. But her fur was still wet. And I was tired. And I wasn't going to stay up all night. So... I took her back to bed. Dog was slightly curious that the creature she watched so intently was now under my bed clothes, but quickly went back to sleep. I tried to doze. But whenever Choey moved, I awoke. But in truth I was happy she was moving. It's now five hours after I found her and she's still under my clothes. And seems better than she has in weeks. Her breathing which was once far too rapid even for a rodent, has slowed and she's not spinning anymore. A good thing. I'm not sure what that would feel like next to bare skin... I'll keep you posted on Choey's progress. October 27thOn my October 16th entry, I note how I was disturbed by the feral dogs we'd picked up, feeling the priority should be on people's pets, but realizing that all dogs if left on the streets could be victims of car traffic or shootings by police. Or other concerned citizens. In the following days I saw more feral dogs being brought in. These were not dogs who'd just not been around people for some time, but dogs as feral as I'd ever seen before. Dogs who somehow had slipped through the cracks of human habitation. One at Winn Dixie immediately caught my eye. She had beautiful brindle markings and had a wild look. She could easily have been from African. She'd been placed in an area reserved for vicious dogs. There were usually anywhere from 5-10 of these dogs at Winn Dixie at any one time. Sometimes they were genuinely vicious, or at least trained to be so, or were just scared and traumatized from the hurricane and events afterwards. One such dog can be seen to the left in the vertical photo, being loved by Bryce, one of the volunteers. To take the vicious dogs out for walking so they could defecate, the dogs would be placed on what's called a 'dog-catcher'�a long metal pole with a collar attached to it. Most dogs were eager to leave their confines. Instead, the brindle dog cowered at the back of her kennel, doing nothing but tremble in fear. Once she was out of the kennel, she had no concept that this was a chance for her to move, with limitations. Again, she would just tremble, and stand rigid. A number of us agreed she should never have been captured and wondered how on earth anyone had been able to come close enough to her to capture her. I began wondering if there was a place in America for dogs like her. I emailed Merritt Clifton of Animal People News and he replied that usually after careful investigations, all the 'feral dog sanctuaries' turned out to be hoarder operations, run by people who would collect animals, usually with good intentions and because they didn't want the animals to be put to sleep, but in the end couldn't keep up with the continual amount of animals. Often the very animals they had tried to save would end up living in squalid conditions with many dying from lack of care and food. The next day when I checked on the brindle dog, I voiced my concern to the woman handling the vicious dogs at that time. "There's a woman who's taking all the vicious dogs to her place. I'll introduce you if you like. Her names Tammy Hansen." "I've got a place up in Arkansas," Tammy said. "These dogs will have such a good life. I've got 200 acres. They can just run free." "That sounds great," I said. "Yeah, some of the neighbors don't like it. We let the dogs chase deer and we have people guarding the edges of the property. But the dogs are happy, and that's the main thing." I had stayed 1 1/2 years before on a friend's 200 acre estate in the Appalachian Mountains, so I had a clear idea what 200 acres was. "So, it's not fenced?" I asked, wondering how they kept the dogs from running away. "Oh yes, some of it is." I then wondered how it was possible for deer to live with dogs in only a 200 acre compound. Surely the deer wouldn't survive. They need large areas to graze, and I could easily imagine the dogs quickly killing captive deer. "Well, in fact," the woman added when I pressed her for details, "only 50 acres are actually fenced." The next day I decided to talk to her further. By this time she was frazzled, claiming that she wasn't getting enough help while working with the vicious dogs, and that she planned to leave that day with all of them. There were an abundance of chows, and a Rottweilller who had trapped one of the rescue workers (who was known as a 'dog whisperer') on top of a car. Somehow they'd managed to capture the Rottweiller, but had to sedate it in order to transfer it from the kennel it had been brought to Winn Dixie in, into a bigger crate. Tammy would also be taking this dog with her. She had received a few dog bites in the past few days. I wasn't surprised. Though she obviously loved animals, she had a frenetic energy that dogs sometimes respond to negatively. As she and her friend loaded the dogs into a horse trailer, her friend mourned the fact she couldn't come to Arkansas and work with her. They were both passionate about animals. I asked if I could come up there sometime and see her operation. She welcomed me enthusiastically. "As much publicity as I can get, the better. It's not cheap running a set-up like this, we've got vets on staff as well as others. Thank goodness the man I married is wealthy!" Her welcome negated my fears. After all, if she had anything to hide, she wouldn't want me, a writer/photographer coming up there. I took down her contact details and wished her well. The system we have in the US, of euthanizing 4-7 million animals every year, is far better than it was several years ago. In 1970, the US national average of killing dogs and cats in shelters was 115 dogs and cats killed per 1000 humans. Now, it's only 14.8 dogs and cats killed per 1000. But this is still far too many. Though I obviously don't condone the actions of the Hansen's, I wonder if hoarding operations would exist at all if we had the homeless pet situation under control. I know if I had 200 acres, I would certainly adopt a plethora of animals. And I know many people who would. Would we, given the resources, then become like Tammy? And inadvertently let the situation get out of control? I hope not. But what if the option was certain death? Adopt a pet. It doesn't matter if it's a Katrina animal, or another sitting in a shelter. Please adopt. October 26thOver a month after my hand was brutally mauled by Fluffy the cat, it's finally healing, though it wasn't until the scabs began falling off that I realized Fluffy's teeth had punctured the nail. This is what happened. A policeman asked a rescuer and myself to go into his house and get Fluffy, because she wouldn't come out for anyone in the family. That's what happens to cats, they turn feral very quickly. So the rescuer his gloves and I got my camera. I decided I'd just take pictures. The problem was, we couldn't find Fluffy. She could only be in two rooms, the top room which had been converted into a little girls playground (and a spoilt girl at that judging from the plethora of toys and stuffed animals that were strewn over the floor, making it very easy for Fluffy to hide amongst). At one point we heard her cry. Then Burt the rescuer picked up a stuffed animal. "Waaaa," it called. I was still sure that the noise I'd heard was Flurry. Fluffy in fact was in the room below, the man's workroom, which was an equally wonderful place to hide. When we began poking around amongst the tools, Fluffy zoomed up the stairs to avoid us, and Burt followed. Seconds later Fluffy zoomed down again. By this time I was on the stairs and even though Burt yelled, LET HER GO, instinct took over and I grabbed Fluffy-between my bare legs! This is not a good idea, I thought. So thinking nothing but the fact I'd captured Fluffy, I brought my hand back to grab her�and she sunk her teeth into me like her life depended on it. And I let go like my life depended on it. But she wanted to finish me off and I could feel her teeth sinking further in before she finally let go. I grabbed a cloth and wrapped it around my throbbing hand while Burt, with gloves, grabbed kitty from her newest hiding place. The family were completely apologetic. And wondered what had happened to their Fluffy. They thought she was demented. Had gone crazy. Was ill. I assured them she'd just been alone too long and was very scared. And that she'd be as good as new in a few days. I wasn't so sure about my hand. After Burt doused and rubbed the wounds with iodine and rubbing alcohol, blood poured for three hours and I let it as I didn't want any infection. The next morning a nurse at the Mutt Shack gave me antibiotics because very quickly my hand swelled to twice the size. And now, a month later, it's almost fine! October 16th I meet Sammy, a man born and raised in Louisiana. He's been living in Florida, but came back specifically to help with animal rescue. I engage Sammy in a discussion about animal treatment in the South. I ask why almost every license plate reads, 'Louisiana, Sportsman�s Paradise'. "Yeah, I love huntin'," says Sammy. "Do it every chance I get. But I never kill more than I can eat. 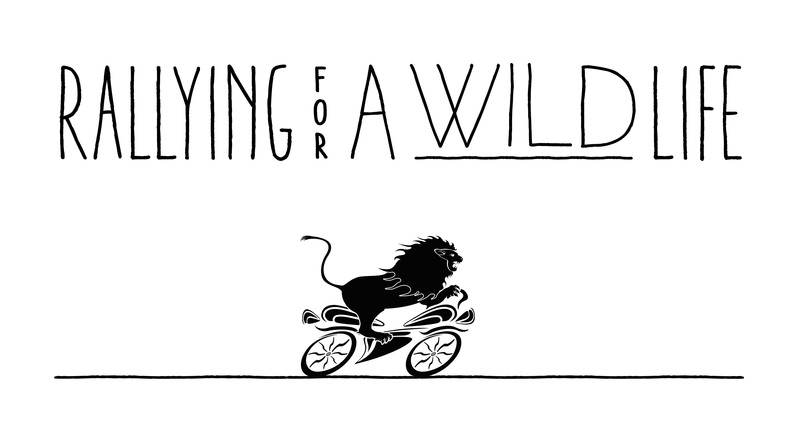 When I was a kid, if my Daddy ever thought I was killing for sport, I would've gotten hell. We was taught to respect animals." We come across six dogs and three younger pups about four months old and tempt them with cans of food. They range from completely skittish to friendly. Several of the females have nursed several litters of pups. We're able to get four with metal dog catcher poles, but the others are too wary. We decide to take the four to Winn Dixie and return later for the others. While Sammy loads up on more donated dog food at Winn Dixie, I get the dogs out of the crates to be tagged, photographed and documented. I quickly realize none have ever been on leads. The last is extremely reluctant to leave the crate despite my coercion. When Sammy returns, he kneels down and grabs the dog's head between his two hands, bringing their foreheads together. "Hey, it's ok, you'll be just fine," he says in a Southern twang, before easing the wary dog who's unaccustomed to people out of the crate. As the dogs are put into separate cages with food and water, I realize these dogs might've known each other their entire lives, and lived similar to dogs I've seen in Africa. Now they were separated. They will not be going to new homes together, as a pack. They will never see one another again. "Do you want to take them back," Sammy asks, full of concern. I do. But New Orleans isn't a place for loose dogs. There are rumors that packs of dogs will be shot by the police. And if not shot, how will so many loose dogs survive if animal groups aren't leaving food? But what will happen to all the dogs being rescued? Those being brought out from people's homes as well as those on the streets? October 14th I apologize for my negligence in keeping up with my blog. Being in New Orleans was far more intense than I'd bargained. Having the option of helping out with animal rescue, taking care of Dog and Bruiser or keeping up with the Dog Blog, I'm afraid the Dog Blog took a back seat. I will endeavor in the next few days to update you on the incredible events that transpired. For those who emailed me, worried that I'd disappeared into a toxic sludge, thank you for your concern! My cat bite from Fluffy the cat is on the mend (details later) and Dog, Bruiser and I are well. The four dogs I transported from New Orleans to Houston are being fostered by Citizens of Animal Protection. September 30th evening Before I can do anything today, I need gas. I get instructions, but once again go the wrong way on the freeway and then have to continue miles in the wrong direction because there's roadblocks at all the exits. I retrace my steps, and somehow end up near the Superdome. I'm told that if I have a pass I can go over the Mississippi bridge and refuel there. There's more vehicles on the street now. Business owner are being allowed back in and the general public will begin returning tomorrow. I can't help thinking it'll be chaos. I have yet to see one working traffic light... I get gas for the van, and some extra gas containers for anyone who can use it, 15 gallons of water and ice. On the way back, I come across a place where they're giving out free ice, water and everything from toothpaste to cans of kidney beans. I don't know what we need at Winn Dixie so I grab an assortment of things and head back. Rather than feeling frustrated I'm not rescuing or directly in contact with the animals, I don't mind. Some of these people have been here for three weeks non-stop. Everything helps. I head back to the school with the photographer from Denmark. More of yesterday's story reveals itself. What I didn't see, or what I chose not to see, were the signs of abuse the animals suffered. A quick death by gunfire seemed acceptable. These new atrocities are not. We decide to go to the other school where we'd heard other bad things had happened. We're accompanied by another car with two men. Yesterday's building now has yellow tape around it. We go to two wrong schools before we discover the correct one. It all looks very calm until I go into one classroom. Another dog, dead. Another room, another dog. All with collars, all with leads tied to a piece of furniture. One room has an open window. But a tied animal, unless it can chew through the lead, has no chance of escaping and possible survival. Though it's not clear how these dogs died. A sheriff who joins us later says at least one was shot. In another room, there's two different bodies of cats in two different kennels. A third kennel is open and the cage is emptyThere's a sign in lovely curly writing on a piece of paper on each kennel, and on the chalkboard just to be sure, stating each cat's names, and the owner's address, cell number and home number. It looks like the people left with the understanding that someone would be by to collect their animals. It's hot, it's depressing and we need a happy rescue. We go to a house we'd been asked to check on. Dead. We go to another, and the dogs, who'd been held in a yard, are gone. Maybe they're alive, wandering the deserted streets, looking for food. Unless they've been shot. There are reports that there is often gunfire. We see two dogs in the distance, but tired and cranky, and indecisive about what approach to take, both dogs disappear. We leave food and water and then drive for 30 minutes back from St. Bernard's Parish to Winn Dixie, where we're told that a group of soldiers had come by and said if animal rescue people are seen in the Parish again, they will be arrested. One of the things I loved about Louisiana when I was here before, was it felt like a different country. It certainly feels that way now. "Can you do a run? It's a short one," asks Mark, the one running the show at Winn Dixie's parking lot. I groan visibly. All I'm thinking of are my own dogs who'd be running around in the van all day long. It's after 3pm. We'd begun at 8. 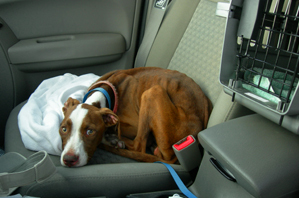 They're getting lots of variety, but they need time in a car that isn't moving, away from other dogs and people. As do I. "I just got back..." I protest. Mark turns to a newcomer. "OK, OK where is it?" "It's near here. They're wanting us to check to see if there's six Labradors. There won't be anything there, so I just need you to check the property out, confirm and report back to me." The house is only a few blocks away, but like many roads, there's no longer any street signs, and a neighboring street is impassable because of downed telephone poles and trees, cutting off access. Very, very few places escaped nature's wrath. I figure the call Mark had received was a crank. Or else if there'd been six labs barking, they'd of received notice weeks ago and been collected. The outside of the house had already been marked, no people, no animals. I walk up the path and know something is wrong. Little ceramic animal figurines line the window sills. This is the house of an older woman. One front window has been broken into, an easy access. I peer inside. Furniture is tossed and heaped all over the room and a layer of mud, silt and waste covers everything. I call, but there's no response. I don't want to clamber in. I don't smell death. I walk around the back of the house trying to find another opening, but there is none. I return to the front and with Dog and Bruiser waiting outside, I climb in. I continue calling. I hear water running in a sink. I make my way carefully over the furniture and make my way back to what was once a lovely bedroom, which is now hardly recognizable as ever being habitated. There's something draped over a piece of furniture. I'm not sure what it is. Is it a piece of fur clothing? The dog has been dead since the beginning. I manuever my way to the bathroom. Everything is brown, the walls, the ceiling, the shower curtain lying crumpled on the floor. Everything except for a circle of cream porcelain and the silver drain plug which has had water flowing over it since...when? Did the woman leave it on for her dogs? I continue past a ladder that's suspended part way down from an opening which leads to the attic. In a front room is another large piece of fur. Enough. I stand a moment in the quiet. It's a lovely house. The woman has put so much love and care into this home. And towards her dogs. I wonder how much pain she has gone through, calling shelters, putting an ad in Petfinder.com, calling, calling, calling. I am so sorry. I get a can of orange spray paint and add what I've found to the wood siding of the house. As I do so, I see a large black cat three houses away. She runs. I get a can of food I was given to me in Hayward by my neighbor Sonja, and some dry food and water and place it under a tree, noting the address. She'll be getting regular meals now. Fourteen dogs, left by their owners in hopes of returning to them, were slaughtered, shot in the body cavity, forcing the dogs to suffer a prolonged death. All were found dead at Beauregard Middle School in St. Bernard Parish, New Orleans. The middle school was a temporary shelter for evacuees who, after flood waters rose, were ordered not to take their pets with them. Many of the pet owners scrawled their names and phone numbers on the wall of the middle school room, in an effort to have their pets reunited with them. All of the fourteen dogs were found shot, lying in pools of blood. These evacuees lost everything. To find out that the pets they tried to save were killed in this manner is the final blow. According to Pasado's Safe Haven Humane Investigator, on the ground in St. Bernard Parish, "The dogs who were shot in St. Bernard Parish did not die immediately. They were not shot in the head to quickly bring about death. Shooting an animal in the body cavity is one of the most cruel ways to kill an animal." According to St. Bernard Parish Sheriff Jack Stephens, the shell-casings are consistent with those used by law enforcement. Before this incident occurred, a St. Bernard Sheriff's Officer was documented shooting dogs in the street by a Dallas news videographer. According to Sheriff Stephens, "We'll get to the bottom of this. If it's one of our officers, we'll let the cards fall where they may. He reportedly has turned this case over to the Louisiana State's Attorney for investigation. Pasado's Safe Haven knows that it takes more than what you think to make a case of animal cruelty. If this person is identified, they may claim "the animals were suffering" "I had to put them out of their misery". To assure that a conviction can happen, PasadoRescuers will take the dogs to a veterinarian, Licensed in the State of Louisiana, for necropsies (animal autopsies). Necropsies can prove whether an animal had been in a state of dehydration or starvation at the time of death. The animals will also be kept, in a freezer, so no evidence will be discarded. In the late afternoon I went with two women and a man and Dog and Bruiser and three crates first to Wales St. to try and find a cat. In the process we found numerous other cats and dogs, but weren't able to capture any. The cats have all resumed to being ferile, despite their domesticated former status. We roamed the streets with fences demolished, looked into shattered houses who's insides looked like a giant had picked up the house, shaken it and the contents up before placing it down again. So much of New Orleans looks like a war zone. The streets are almost empty except service vehicles and a few residents and police cars. Everyone pays little attention to the usual traffic rules and stopping in the middle of a four lane highway to ask for directions is common place. People also drive the wrong way down streets if it's easier than going further down, making a U-turn and heading back again. We then headed out to the high school in St. Bernard's Parish to pick up some dogs who'd been spotted there, as well as to photograph the interior of the school and the killed dogs. 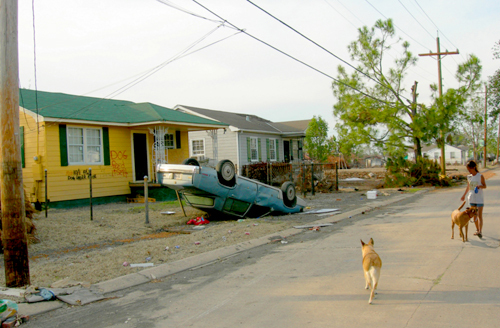 The dogs had been dead a number of weeks, most likely from the time residents had evacuated from Katrina. Presumably, the owners had places their dogs in different classrooms, some tying them to the wall. Some of the animals have their collars on with ID. Spent ammo lies on the floor. A few left notes on the wall. One read, "This is my dog Angel. She's very friendly. Please don't shoot her." I am not including photos at this time. If anyone has a media use for this photos, please let me know and I will send the pictures immediately. Dog and Bruiser come with me. They react as I expect they would. Curiosity, caution. Not horror as we would. To them, these animals no longer exist. They are gone. To put a happier face on the evening, Dog and Bruiser rescue a dog no one could get near. It was loose. It is now caged. It's a hard choice to make, but America isn't a place for loose dogs. On the way home, I see what I think are four boys on bicycles. I slam on the brakes and swerve. The eight legs are actually two black cows wandering across the street. No, America is no place for loose animals. And we've broken our 6pm curfew. September 29th I get lost again, and wind up in Mississippi. I consider continuing to Biloxi where other animal orgs are, but I'm drawn back to Louisiana. I pull over to a Louisiana Welcome Center. Like the other one I stopped at at the Texas border, this one too is closed, trees uprooted, complete mayhem. This one from Katrina, not Rita. I check email and better directions from Mapquest. I have an email from a woman who's three dogs had been rescued, but were somehow misplaced en route out of the area. If anyone knows the whereabouts of the three doggies, one four year old white Maltese, one three year old brown Maltese and a ten year old dull red toy poodle, please contact me and I'll let the owner know. The woman is completely distraught. One of the dogs was given to her by a cancer patient and promised to honor her dying wish to take care of the small dog. I begin again, stopping en route at a story to buy a fan. My only remaining weapon for the mosquitoes. I won't go through another night like last night. I ask a few different people for directions to get me through to New Orleans. This is the worst damage I've seen yet. House after house heading to the Ponchtrain bridge is demolished. Boats are tossed and lay on end at crazy angles. Just like on tv, but I saw little tv coverage, getting my news on the internet. Even so, I think the most glutted news viewer would be shocked. The carnage goes on and on and on, mile after mile. Piles upon piles of debris, cleaned out from houses is heaped ready to be disposed. The bridge by comparison swoops over the water which lies peaceful now, with only a few waves breaking the surface. The water is a respite from the chaos. We line up in the heat at the police checkpoint. I have a orange shirt folded on the dash and On a Mission from Dog stenciled on the side of the van, but I'm hardly an emergency vehicle. "Where ya headin,'" the black cop asks. "I'm going to Winn Dixie, to pick up some animals." "Winn Dixie sells food," the cop says shaking his head. I laugh. "Yes, it does, but now the parking lot is a rescue station for animals." He waves me through. I see the Winn Dixie from an overpass. A few tents are set up in the lot to shield caged animals from the sun and a few RV's. There is wreckage all around. But it is here that hundreds of animals have been rescued by a couple who got tired of the red tape of other animal rescue groups and started their own. As I pull into the lot, two SUV's with signs on them slowly pull out. I have a hunch I should talk to them. I don't follow the hunch. As they drive down the street, I'm tempted to follow, but I don't know why. I begin talking to people. The two SUV's left to go to a high school where a number of dogs had been chained and shot dead. Rumors had begun and ended a few weeks ago about police shooting dogs. No one yet knows who shot these. I circulate the kennels, trying to find what kind of people travel across the country and two have even come from Denmark to help here. I talk to a secretary who has three dogs of her own in Idaho, who took five days off from work. An animal control officer from Michigan. A fitness instructor with bulging muscles and tattoo's from Denmark. A construction worker, a computer game programmer, a real estate broker. They range in age from early twenties to early sixties. Men and women. Their only bond it seems on the surface, is their devotion to animals. The animals coming in are utterly amazing. I see a number of teams of two people bringing in dogs that really do look like they've been without water and food for over three weeks. Others look as if they've just been out on the streets for a few days. There's one small fluffy little dog who was found by some men from the Army Corps of Engineers. It jumped onto an overturned sofa and was barking at them, still guarding his house. The one story house had flooded to at least five feet. It's covered in black filth. It immediately gets a bath along with a Husky who's also covered in toxic waste. When the couple who rescued it walk away, it immediately begins getting worried. The man wants to take it with him when he leaves tomorrow, but can't. There's about fifty volunteers, though the number varies. The number of animals coming in ranges from 50-100 a day. They keep them no more than 48 hours, before handing them to other groups. I ask the beefy Danishman who's never done volunteer work like this before, "When you go back home, will you volunteer at a local shelter?" "We don't have animal shelters in Denmark. All our animals have homes." September 28th I drive all day from Houston. The devastation begins at Port Arthur. Tree after tree after tree is snapped in half like sticks of celery. The huge red and white box of a Jack in the Box has been tossed up and onto the ground. Mile after mile of billboards are bare, their paper ads strewn over nearby fields. I didn't expect it to continue for so many miles. I smell gas. I pull over and discover that gas is seeping out of the top of my five gallon container and onto the carpeted floor of the van. "Damn." I pour 2 1/2 gallons into the tank and continue on, hoping some papers underneath and air will absorb it. Instead of going to Gonzales, which is the main staging area for many animal groups, I continue on to New Orleans to see a smaller one. I get lost. There's been a detour because of a bridge out, and I can't seem to follow the directions. It's getting darker. This area, Sidell, is habitated and chainsaws buzz and large blue containers sit full in front of everyone's house to hold the debris. I have to stop. After going miles in the wrong direction, I see a sign for a Wildlife Refuge. Not a place you're typically allowed to camp, but I don't think anyone will care. It's gorgeous. Spagnum moss hangs from trees whose roots sit soaking in water. It is quiet. And there's no mosquitoes - until I begin eating dinner. I quickly put up some mosquito netting and Dog and I jump onto the protected bed. Bruiser seems happy outside. The mosquitoes find ways inside. It's not so much I hate being bitten, it's that I can't stand the noise. It is not until now I remember that mosquitoes are one of the reasons I had to leave Louisiana. All through the long night I battle with them. The air is still and hot. The gas fumes fight with the fumes from the 100% deet I've gingerly sprayed onto my face and arms. It's suffocating. And still the mosquitoes persist. In the end, deciding the mosquitoes are marginally better than the fumes, I tear down the netting and lay deeply tired, but unable to sleep. It's a long night and I feel I've failed on this trip before I've even begun to help any animals. I wonder for the umpteenth time, if I would've been better off staying in the desert and designing ads encouraging people to adopt stray animals than driving 2200 miles to assist more dramatically. September 26th News has just been released that in Holly Beach, Louisiana, (picture to the left) every single building has been destoyed. Everything. I spent some amazing time there and it was one of the few places remaining in the US where you could camp on the beach. Exactly one year ago, I tried to find a little place to rent, but was unsuccessful. Hopefully everyone left before Rita hit, taking their animals with them. September 25th Before going to sleep last night, there was an insistent knock on the front door. Full of resentment about being disturbed, I reluctantly answered the door. It was the police. "Do you live here?" the woman asked accusingly. I bristled. "No, I don't," I replied honestly. Apparently a neighbor who'd just returned from Dallas, had seen me moving about in the kitchen, noticed a vehicle they'd never seen and called the police. The policewoman tried calling my friends who were still in Dallas, but of course all the lines were busy. A neighbor on the other side vouched for me and the accusing neighbors came over quickly amidst many apologies. I went back to bed and felt like I didn't belong here...which I don't. The rest of the night was blissfully quiet. I'm not sure a curfew is being enforced, but there was no drone of traffic beginning at 3am as people rush off to work. On our morning walk, a man with a Maltese fluffball said that after 42 years of living in Houston, he loved it quiet like this. "But this is where the jobs are," he bemoaned. For all who are interested in a more fluid life but who wonder how to earn a living while doing so, please check out: Horizon's Unlimited. September 24thThe air is completely still when I waken before sunrise, though slightly cooler. I quickly check CNN on my laptop and discover the storm came down on the Tex/LA border...not in Houston. "Dogs, we've got to get to Houston before everyone else wakes up and wants to get back to their homes. No time to waste." I realize if I don't move now, I'll be one of many in gridlock traffic. I give them a quick walk, some leftover steak from a few nights ago and leave without seeing more than a few deer behind the high metal fence. The streets are pretty empty the 30 miles to Austin and then I see begin seeing people with cars packed with belongings and bedding going in my direction. After a few hours of driving, I skip down to 1-10 half way in-between San Antonio and Houston. The traffic is still ok. About 30 miles from Houston I turn on the radio and listen to the mayor asking people not to return until there's been time to access damage and restock stores and gas pumps. Too late for myself and others who are almost there. It begins to rain slightly. I get lost getting to my friends house and find myself in a area usually packed with heavily traffic. But today, the streets are empty. Only a few people are driving and a young couple are wandering the streets in the rain, delighted with the emptiness, as am I. Houston minus two million people is not so bad. After 3 1/2 hours of driving just today, and countless others from California, I am here. The dogs as usual, are at home. They flop on the floor and on our daily afternoon walk, they ran up to dogs they met a year ago when we were here. Not dogs who were left to fend for themselves, but whose caretakers also stayed. Hopefully people did learn something from Katrina. My friends will stay in Dallas until Monday so the dogs and I will catch up on 1 1/2 weeks of travel. Instead of writing this in the desert, I'm sitting on a screen enclosed back porch while circado's chirp and moisture from the rain fills the pores of my dry skin. It is hot, and it is humid. Life is good. I think of two of the women I spoke with in Kerrville whose houses were on the water in Houston. Women who had gathered up their dogs, in both cases five, but left their cats, rabbit and horse. Both women were nervous about what they'd have left when they returned. They will also be thinking that life is good. But unbelievably, three weeks after the last hurricane, people are still finding pets alive in Louisiana and Mississippi. There is still a reason for me to continue this journey. September 23th This morning we walk around the parking lot of the hotel. Cats and dogs peer outside from hotel rooms. I've never seen so many animals in a hotel. All refugees from Houston's mass exodus. I also find dogs stuck in horse trailers along with a collection of farm equipment, and two boxers chained in the back of a pick-up truck. They are 'rough' looking dogs and I'm sure not usually in the owners house. But I wonder what's going to happen when the day heats up. I hope the owners will have the sense not to leave them in the sun all day. Though I had a great time last night with Doug, I now feel totally frustrated though I'm uncertain I could've actually gotten into Houston before they began turning people away and turning both sides of the freeways into exit lanes. The reports on the news are predicting the level of winds in Houston where I would be staying will be about 80 mph. I've been in winds like that before, and feel it would be ok to hunker down there. And then leave for Louisiana. I fear when the worst blows over the highways will once again be wall to wall traffic. And there's the problem with gas. There's none in many areas. Before I leave here I'll top up and fill my 5 gallon gas container. I wish I had another. Doug of Texas Camel Corps leaves here tonight to return to Waco. It's too out of my direction. I take a back road and head towards Austin. Though maybe I should give my excess things to Doug? Like many, I feel lost as to a plan of action. But staying here in the hotel is not an option. The room is already spoken for. All circuits are busy for cell phones. I ponder staying in a Wal-Mart parking lot, to be around others. But once there, I feel no desire to do so and keep moving. I pass Johnson City, birthplace of Lyndon B. I finally stop before sundown about 30 miles before Austin, down a gravel road which I predict will be fine in even a heavy downpour. At the end there's a court, with fencing nine feet high with miles upon miles of grassland and forest beyond. I'm sure it's hunting grounds. But what would need nine foot high fencing? I imagine giraffe, hyena and lion inside. Though it's probably just deer. There's a slight breeze to alleviate the oppressive heat and a little cloud cover. And in the middle of the night, the breeze stops. September 22th Once again I dip into the pool of water, while steam rises as the sun hits it. And once again, Dog stars from the shore, sure this is a bad idea. It's a glorious place, but it's not mine and I need to go to a place where I have cell connection so I can let my friends know I'm coming and send in a magazine article that's due. The heat is oppressive. It's like all the southern states are waiting for the storm. September 21th-Middle of the night. A pick-up truck comes around and shines his lights in the van and honks his horn. Dozy, I lean my head out the window. It's the Sheriff. "This here's private property, I'm gonna have to ask you to leave." I tell him I'm on my way to Houston and ask him if there's any BLM land nearby. (something that doesn't exist in Texas, where there is almost no public property whatsoever) The Sheriff looks at his watch. "If you promise me you'll leave at sun-up, you can stay." It takes me forever to get back to sleep and no sooner am I in a deep slumber than a horn sounds again. This time it's a woman who's seething with anger. "The sheriff came by a few hours ago and said I could stay until first light." "Well it ain't the sheriff's land." Over the back of her head, I could see the flattened deep red yolk of the sun just showing itself. The woman slams the truck into gear and her dust obscures the sun for several moments. After she leaves, I think of all the acidly sarcastic remarks I could've made about Texan hospitality. Too late. This is not a great way to begin the day. I find another dirt track, get out my computer check email and do a little work before my phone rings. It's my friend Kathy, who I'd planned to stay with in Houston and unload my excess belongings in her families garage before heading east. "We may not be here! Rita's now a Category 4 and we might leave here tonight or tomorrow morning." Geez. Now what to do? I decide to go snorkeling at the springs in Balmorhea. Fish and turtles are everywhere. They do their work, and tensions flow from me. Catfish come around and keep coming until I'm surrounded by 20 of them or more. They're curious. With my two diving buddies, we'd swam with hotdogs and turtles had nibbled at us. Now I have nothing, but when I stay still, the catfish tentatively nibble on my skin. I am calm. A few hours later I talk to Kathy's husband and tell him of a mutual friend of ours who will be in the town of Kerrville with two of his camels giving presentations for a storytelling festival which concentrates on Texas and Natural history. In the end, he leans towards staying put in Houston. September 20th. I do nothing but drive. They say when you travel in Mexico are spaced so far apart that you should fill up wherever you can. The same could be said of Texas along highway 1-10. Twice I use a technique described in Blue Highways by William Least Heat Moon, which is to drive at 50 mph and keep your buttocks muscles firmly tensed. It seems to work and I glide into a Shell station on fumes along. I also see my breakdown in Benson, Arizona as a blessing. In Texas, I'd be sure not to have cell phone coverage, though T-Mobile says otherwise. I make it to Balmorhea where a year ago I'd met two wonderful men from Dallas who invited me to use their diving equipment in the man-made springs the size of two Olympic pools. Their suits and equipment were ten sizes too big, so the diving was stressful, but the snorkeling and company were great. I return to The Cutest Little Restaurant in Balmorhea and order what I'd ordered a year before-chilli rellenos. I find a dirt track with sign giving a number and letter on it-a county road. I take a side lane for fifty yards or so. There is nothing but scrub. As the moon rises, the coyotes come out and call from all different directions. Bruiser runs in first one direction then another, howling to any who'll listen. One coyote in the distance tries to disguise his call, making it sound like he's actually three. I'm not fooled. September 19th I decide to stay put. After walking the dogs, we return and find the van surrounded by about 30 cattle, curious. I spend the morning leisurely making notes for an article I'm working on, and reading. My thoughts have intense clarity. Though yesterday was scorching, there's a cool breeze. In the afternoon, I open the back of the van and lay on the bed while a few drops of rain, which will never stay put in the dusty ground, fall on my face. The day I decide to stay here, is the day there is some relief from the heat. I feel blessed. In the evening after walking the dogs, I go and visit with friends. What day is it? Sunday. I quickly do Mapquest and discover I'm only 2 1/2 hours from Carrizozo, a town I lived in almost two years ago. They have a potluck every Sunday evening at 6pm. I could go! Two years ago, I was invited to Carrizozo by a woman who'd lived in Saudi Arabia for 12 years. Many others in the town also had passports and had travelled. A woman in her mid-80's had once lived in Rhodesia, when it was Rhodesia. I'd stayed there for two months, paying $200 a month in rent. It was a low time career-wise and out of desperation, I'd resorted to waitressing and bartending - the first time in over 15 years. Even so, I had wonderful memories of the place and the eclectic community. On the way, I drive near the Rio Grande. It looks cleansing considering my dusty state. I find a dirt track that goes along side it. I pass a large camper that looks as if it's been abandoned. It's piled high with junk and even the front seat area is packed with old clothing. I drive on a short ways and come across a lawn mowed down by cattle right next to the water. There is shade. I stop. There's a grave marker with 'Scooter-We love you' written on a cross along with a drawing of a dog. Already it is hot. And the place, despite its idyllic surroundings has a strange feel about it. The dogs and I walk down one track and then back to the water and suddenly we're near the abandoned camper. But it's not abandoned and an older man is reclining in a chair. I wave, and he waves back. Accompanied by the dogs, I walk over to him. "Pull up a cement block!" "Nice place you have here." "I'd rather be in Miami Beach." "It would be a bit more crowded there." He seems friendly enough, but there's something odd about him. He's lived in this camper in different locations in the Southwest for ten years, and in another vehicle for ten years before that. He's a non-stop talker. I don't feel easy. He takes off his sunglasses and his eyes are brilliant blue. So brilliant they're unnerving. Just then Bruiser begins sniffing at a tall pole nearby. I look in the direction he's looking and there at the top of the pole is a rat in a noose. Time to leave. I drive a few miles upriver, looking for the perfect spot, with trees for shade, grass and a view of the river. I tire myself out and somewhere along the way loose my drinking container which ensures I drink enough water. "Geez Lorraine, just stop for heaven's sakes!" The truth is I feel restless and now that I'm beside the river with the internet access and shade, I can't imagine staying here to do publicity for the cat book. The South is still calling. I feel the need to be there. The dogs by comparison, are happy wherever we are. I check email, ignoring the beauty around me. It takes me over an hour before I get into the water. When I do, it is glorious. I wash my hair and snorkel in the gently moving current. I have the river, the internet access and the shade, but can't imagine staying here for the night. So at 3pm I pack up and head towards Carrizozo to see friends. By the time I arrive, it's 7:30pm. I couldn't find the right house and forget there's an hour time change. Some people, after three evenings in a row of activities, are tired and beginning to leave. I too am exhausted. After a few hours and too quick of hello's and good-bye's, I leave and head to a dirt road where I used to walk the dogs. I'll camp for the night and head for the South in the morning. September 17th-Morning. I feel brilliant. But as the morning wears on, it becomes hot and without really thinking so clearly, instead of moving the van underneath the shade of a tree, I pack and head to New Mexico, where I think it'll be cooler and where I'll have internet access for my laptop. We drive for hours in the hot sun. "Haraka, haraka, heina baraka," I think. Swahili for 'There is no blessing in haste.' The landscape is barren. And it's hotter, not cooler as I'd hoped. I take a turn and head north and head for the Rio Grande. Hours pass. The town of Hatch is known for its chilli's. I'll remember it for being bleak and inhospitable. We camp off the main road. The ground covers my feet with talc. The sun has almost set, but it's still hot. I'm miserable. But I have both cell phone and internet access. I discover none of the messages couldn't have waited another day for a reply. "Haraka, haraka, heina baraka." There is a full moon. I'd promised myself that I would be camping during this next cycle. I am. When the dogs and I return from our walk, I discover more flies in the van than I've even seen in any one place - even in Africa. I turn the van carefully so the breeze will hopefully keep their numbers downs, nervous about getting stuck in the soft dust. There's a zillion flies no matter which way the van is turned. September 16th-Morning. It's noisy on the main road and I wake a few times despite my earplugs. We return to the desert for our morning walk. On a plant which bears bulbous fruit Indian mothers use to ween their babies from nursing, two desert flowers are opening. I wouldn't have noticed their beauty yesterday. I sit down underneath a Juniper tree. Sap from the trunk has fallen onto the sand in tiny beads. Sunlight radiates through them. After the fuel pump on the van is replaced, we cross a river which is flowing from rains they had here last week. I stop. We clamber down the banks and I wash my hair in the flowing water. The dogs and I play. This, is how I remembered my desert journey's. And this, is what my soul yearns for after four months in the city. I buy supplies in anticipation of a few days spent regrouping. Outside Safeway, a woman is having a raffle for Hurricane victims. They'd collected an entire container load full of items last week and will be sending more to Tucson on Monday. "Do you take items for animals?" "Call this man, and he'll meet you and take your things." We meet at Gas City, and I offload most of the pet food and all the kennels. The supplies will get their quicker through them than through me. I continue east on 1-10 and stop at the Dragoon Mountains, where gods have balanced giant rocks carefully atop each other before placing bets on how many centuries they'll stay that way before toppling and crushing whatever lies beneath them. I've camped here before. It's a magical place. I spend the afternoon reading Love in the Time of Cholera and drinking Californian two-buck-chuck which costs four in Arizona. September 15th-Morning. I sleep like a saguaro cactus. And again, I don't want to leave. Cyndi emails me giving me more info to pass on to Michelle, the woman with the dogs in Charlmette. As I pack up, I discover a few of the ants which have travelled almost 1000 miles with the dog food are milling around on top of the van. By the time I get a signal, I know I'm pretty close to Benson, a town I've stopped in before. I might as well keep going. When we get to Gas City, I run in, frantic. "The bathroom's that way," the manager says responding to the horror in my eyes. "I don't need a bathroom, my van broke down and my two dogs are still there. I need a tow truck!" The man pulls out a two-way radio and calls his fried. "Someone will be there in 15-20 minutes." The fifteen minutes is endless, but not as much as the 15 miles it takes to drive back, and the five miles we have to go to reach the next exit, and then another five miles back travelling east once again. Oh doggies, I think nervously. I get even more nervous when I see cars stopped on the freeway with three police cars about 100 yards in front of the van. No, they couldn't have gotten out. But I remember the $2000 fine Arizona has for leaving animals in a vehicle unattended. I leap down from the tow truck and yank the sliding door open, certain it's sweltering inside. The dogs great me happily, but not frantically. It's hotter out than inside, thanks to the white van reflecting the suns rays. While the tow driver disengages the differential, and we sit by the side of the now whizzing freeway, I think, What if I had 15 animals in kennels in there? Suddenly, transporting animals in the South, a solution to my wanting to help but keep my own dogs with me, seems a questionable and risky alternative. By the time we reach the shop in Benson, it's too late for them to work on the van. We spend the night in the van parked outside the garage. But not before I walk with the dogs in the desert out back and wonder what I'm doing. This is the second breakdown in two days. Is this a sign? I decide I need to slow down. The past four months have been hectic. I need a break. I decide to take a few days off to regroup. Maybe going to the South isn't the best thing for me right now. But I don't know in my present frazzled state. September 14th-Morning. I sleep like an entire forest of Joshua Tree cacti, and wake wanting to do nothing but sit and soak up the desert. I watch the sun rise through the side window of the van. The first sun that touches the horizon in almost four months. It's pink. No brilliant hues of magenta shrouded by turquoise clouds. Just pink. Perfect. I walk the dogs. They're naked, no leashes or collars. Not a building or house in sight. 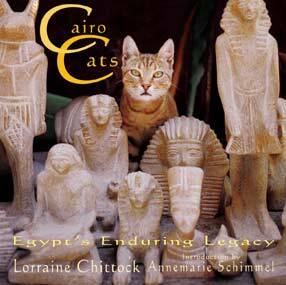 I check email and discover they're finishing printing Cairo Cats. I continue checking and replying to emails and contemplate staying here a few more hours. Or a day. I love the desert and don't want to leave. The last email is from a woman named Michelle. Her dogs are in her house in Charlmette, Louisiana and the authorities won't let her return. Prokchop is a Chocolate Lab with a collar and Brany is a white Lasha Osha. She's checked Petfinders and every animal site she can think of. Can I help? I pack up, brushing the ants that have converged overnight on the dog food and head out along Highway 58. Late afternoon-I aim for the Sawtooth Mountains near Arizona City. I call Ken and Paula, Texans who lived in Saudi Arabia for 11 years and who I shared sundowners with many months before. He's been in and out of hospital and can't meet up. "There's been a lot of trouble down at your camping spot," Ken says. "Some wetbacks car jacked one of our cars at gunpoint. And then another killed a man in town." "Hmm. Well, if you're not going to be around and the smuggling situation is worse maybe I'll keep going." Arizona City is a hub where smugglers meet Mexicans coming around the border, and Border Patrol and vigilantes hope to meet them and send them back. It's a hubbub of activity and I'd spent an interesting time meeting characters from all the different camps. "If you want to camp there, I'll send some of the men around to check up on you." Any other time and I'd probably have declined the help, but Texan hospitality, like that in the Middle East, is of utmost importance and I graciously accept. But the road to Arizona City is long and I only make it just past Gila Bend. (pronounced Heela). I take Freeman Road exit, a place I've wanted to camp every time I've driven this route, but never have. It's wonderful. And there's even a radio antennae that gives me reception to set up this Dog Blog. It's all open BLM land and cattle mill around. We go for a wonderful walk. I boil water to put in my thermos for tomorrow mornings tea, and throw a potato on the fire. Instead of putting the extra dog food on the ground, I haul it up to the top of the van. Coyotes call out and Bruiser replies. We are at home here. September 13th-Morning. I'm finally ready. The van's packed. The kennels and food I was given by Friends of Fairmont Animal Shelter, John Giles and Amy are loaded. Sonja Chen had gone around the neighborhood wearing a pink On a Mission from Dog T-shirt I'd given her and collected money from the neighbors to be used to help animals in the South. Dog and Bruiser are in the front seat waiting for me. I've got a full tank of gas. It's cloudy and cold, so no need for dark sunglasses. I have only one errand remaining-to pick up a copy of Love in the Time of Cholera from the mechanic who's done some work on the van in the past four months. Two blocks from his shop steam emanates from under the hood. I turn off the engine, leap from the van ready to evacuate the dogs and as much belongings as I can. But instead of a fire, anti-freeze is pouring onto the tarmac. The temperature gauge is fine, so I start up the engine, run two red lights and cruise the last fifty yards into Dave's shop, straining with the steering after I turn the engine off and put the van in neutral. "That's a pretty dramatic entrance," Dave says, as steam in front of the headlights looks like dry ice on stage at a rock concert. Dave has yet to let me photograph him, a shame since he's so dramatic himself. Return him 200 years in a time machine and he'd be on a pirate ship, his flaming red hair and beard framing his ocean eyes. His parrot which he keeps in the shop bites everyone who dares to extend a finger. In the office, a pirate statue sits next to a 3x3 foot cartoon of an American eagle filing it's talons. Animal skulls line the shelves. A few hours waiting for a new pipe to be fitted which the radiator hose will attach properly onto is just what I need to regroup after frantic days scurrying around and four months of city life. Ted Simon the author of Jupiter's Travels writes, 'The interruptions are the journey.' And I was only two blocks away from his shop... I barely manage to slow down a bit and use the time to chat, and move some of the boxes of dog food and bedding around so Dog doesn't slide over to Bruiser's side of the bed, since neither want to lay in the back with the kennels. As we head down Interstate-5, I take in the sky I've forgotten existed while spending months surrounded by trees and buildings. I exit down a country lane and stand with the dogs while we breath in the wind coming from the west. We head towards California City to BLM land I'd found on the way to the Bay Area. It's almost dark by the time the dogs and I finish our walk. As we near the van parked just off a corrugated dirt road, Bruiser runs up to me, submissive. Something is wrong. "Oh Bruiser, cholla cactus already?!" He stands subservient while I pull the thorns from his mouth. It's dark. I feed the dogs dry food with the breast of a rotisserie chicken while I devour a thigh. I forgot matches. I can't find my old flashlight. I can't get the new one to work. The solar light hasn't been recharged by the sun. I fumble with a knife, making a spinach salad by the light of the moon and the illumination on my cell phone. I'm out of practice. And too tired to read Love in the Time of Cholera. I turn the cell phone off at 8:30 and am asleep by 8:35. September 6th-People are asking, "What's the mission on your ON A MISSION FROM DOG T-shirts? The expression, borrowed and altered from a famous line in a Blues Brothers movie, is the title of my next book. I also hope the slogan will reach the same popularity as Dog is my co-pilot, with every wearer using the expression for their own personal mission. Because missions can change with circumstances, my mission right now is to delay my trip to Central America and instead, drive from the San Francisco Bay Area to assist with animal rescue efforts already in place in Louisiana and Mississippi. 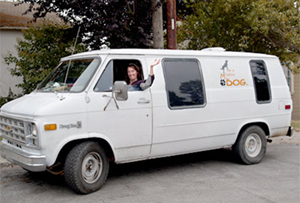 Because I have a van, I can supply animal transport as well as help with some carpentry, rescue and animal care. I will have email access from my mobile office and will do my best to give updates with photos and words. From what I hear, facilities in the field are practically non-existent, and volunteers are being asked to bring in their own camping equipment, food, toilet paper etc. Since I've spent much of the last two years camping in wilderness areas, I couldn't be more prepared. The problem is my two dogs. I'd have to take them with me, but there is nowhere to accomodate them while I work in the field. Is there anyone in Mississippi, Louisiana or east Texas who can take care of my two dogs for 4-5 days at a stretch while I volunteer my time? If so, please contact me. As children and adults we play a game. The storyline goes, "If the house is burning and you could only grab three things, what would they be?" Before Katrina hit, people with transport grabbed what they considered their most precious belongings; their children, documents, or photographs of their personal history. Many took their animals. 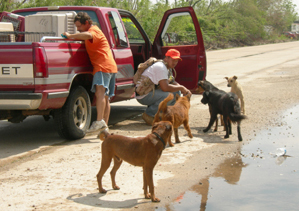 Others will have boarded up their homes, put out a three day supply of food for the family pet and hoped for the best. Many of those animals are now gone. Others, like the people we're seeing on tv will be clinging to life, scared and hoping to be rescued. During South-east Asia's tsumani, we heard of some wild animals walking to higher ground. In many places hit by Katrina, the wild animals may have done the same, or perished. Nature takes care of its own in whatever way she feels is best. But I believe the animals we've spent 10,000 years or more domesticating are our responsibility.